Your vacation in our accommodation in Corvara will not only be about relaxation, nature, and outdoor activities, but will also get an artistic touch. In Garni Raetia, more precisely in Stüa dal Tê, you will get a chance to admire a wide collection of Art made by the owner Raimond Mussner: in particular his watercolor paintings of well-known “ Ladin Hamlets". 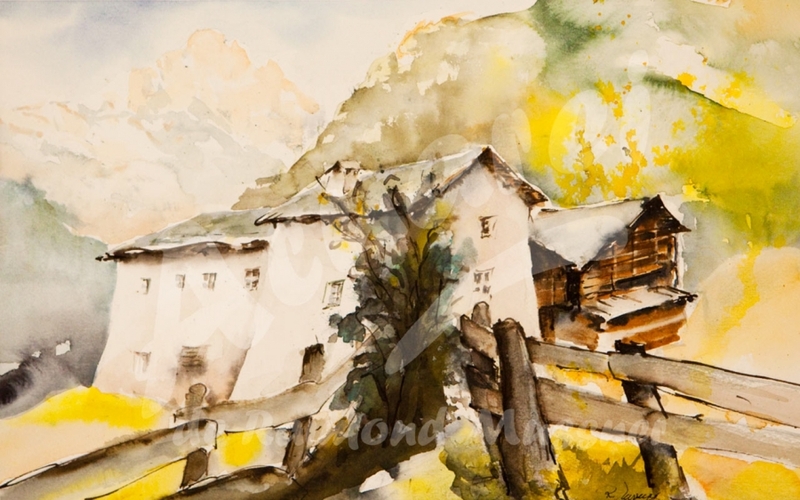 Featured paintings give you insights into the Ladin architecture over the past hundreds of years, as well as the way of living and lifestyle in Val Badia and Gardena in those days. This well-known local wood carver and painter (Aquarelle - watercolours), was born in St. Ulrich, Val Gardena, and currently lives in Corvara, Val Badia. He attended three-year Art school in St. Ulrich, and later worked with sculptor Heindl Moroder Doss in the same town. During the summers of 1979, 1980, 1982, and 1990, Raimond has been studying in the international summer Academy in Brunico, where he took numerous art courses from world-renown professors and artists such as Professor K. Pack, Alain Bonnefoit, Max Herold, Ilsa Kesselgruber, and Heribert Mader. He demonstrates his passion and love for Ladin region by devoting his aquarelle paintings to motives of nature and typical Ladin hamlets. He took part in many exhibitions, including the ones in Circolo in St.Ulrich/Gardena Valley, Germany, Bolzano, and in St. Ulrich/Gardena Valley. With the local Gader Valley Art Group EPL, he has presented his artwork in numerous places - Gader Valley, Fassa Valley, Arabba, Milano, Stuttgart, etc. During 1990 and 1993, he presented some of his artwork in the art exhibition “La Goccia” in South Tyrol in Laives-Bronzolo. His personal exhibitions are currently featured in: Corvara, Cultural Institute “ Micurá de Rü” in St. Martin in Thurn, Fassa Valley, Wolkenstein/Gardena Valley, and Jennbach/Austria. Since 1995, he has been working in his own small gallery in Cafe - Stüa dal Tê in Corvara.